One of the greatest things about making your own baby food is the complete and almost total lack of having to go out and buy a lot of tools. The odds are that right now, your kitchen is full of the items needed. Many people achieve great purees with a blender while others cannot and thus swear by their food processor. I have always had the best luck with the food processor. The blender is best suited to working with liquids or already mushy solids. The blender is not very good for making small batches of homemade baby food however. This is due to the size and shape of the blender basket. The blender is also good for chopping ice and due to its shape and oftentimes larger container, you may believe that it might hold more than a food processor at first glance. Its key abilities are liquefying for smoothies, ice drinks, soups, and purees. In general, the blender will allow you to make very fine liquid purees; but may not work as well for pureeing up 3-4 carrots for example. The Food Processor is best suited to working with a wide variety of solid foods. The Food Processor will even grind up grains for making homemade baby cereals. Its great claim to fame is interchangeability. The food processor can puree, slice, dice, chop, shred and even knead dough if required. It has interchangeable disks for all sorts of different jobs. Typically, the food processor works at one speed only and thus, seems much slower than the blender. The food processor has blades that may rotate in different directions, allowing for the chop or the puree methods. Also, the food processor gives you greater control over the processing of foods due to the innate pulse action. 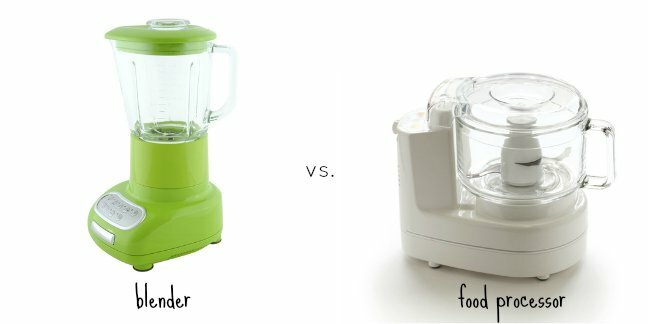 So which is best suited for you, the blender or the food processor? If you have both machines in your home already, I suggest you give them both a try and then make your decision. If you have one or the other, it’s not a MUST to go buy the other. For every type of machine, watch how much food you put in the container baskets to begin with. No appliance will do a good job if it is over stuffed. Fill the containers less than half way full and add a scant amount of liquid to begin with.